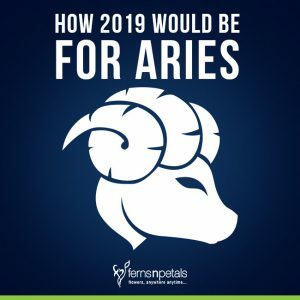 How Would 2019 Be For Aries Zodiac Sign? Aries – the first astrological sign in the Zodiac is a fire sign with mars as its ruler. People born between 20th March & 20th April fall under this sign. Aries are those people who consider themselves superior to the rest. They carry a fiery attitude and exuberance like no other. Aries are great leaders and are optimists. You will always find an Aries jostling with “something new” and making things happen. They are brave people who love to take the “path less traversed”. The people born under Aries zodiac sign often exhibit a dynamic nature and spontaneous energy. Their intrinsic charisma leads them to convince people. Aries are mostly compatible with Leo, Sagittarius, Gemini, & Aquarius. Tomorrow would be the beginning of the Aries month and it is the right time to know how this 2019 going to turn out for Aries people. 2019 has decided to throw a curveball at the court of your love life. The way to love is pretty much zigzag & is full of twists & unexpected developments. So, be ready to expect storms, winds, rains, and scorching sunlight – all the hurdles to come your way. The singles will find it difficult to search for that Mr. or Ms. Right. Maybe you have to wait till April to see some progress in this chapter of your life. So, don’t forget to put the Arian charm on yourself and hang in there in anticipation. Those who are in a relationship will have to invest quite a lot to gain the attention of the partner. Married people should remain careful a bit about attraction outside the parameters of marriage. Remember to communicate well with your partner. Health seems bright for the Arians in 2019. In fact, you can start hitting the gym or practice yoga to stay fitter. But that doesn’t mean you should avoid the regular health check-up on vital issues. While most of the year, you will remain healthy but it is suggested to take care of your mental health. There are chances that stress of your personal and professional life may eat up your mental peace & sanity. You can start to do something different that will help you distract from your stress and also stay fit like joining a dance class or learning a new skill. The department of finance looks promising for Aries in 2019. Some initial developments at the beginning of 2019 would boost your confidence for moving out of your comfort zone in terms of investments and business. You may come across some new avenues for financial investments along with great earnings. But that doesn’t mean you can take your finances casually. Don’t forget to stick to your budget and financial plans and to avoid any financial problem. Also, focus a bit on refining your savings rather than improving your lifestyle. So, this year is more about a financial meditation where you have to iron out your strategy – respect money and see the result by the end of 2019. Saturn is the lord of your 10th house and it has quite an influence in your career. Saturn sits at your 9th house at the beginning of 2019 and that means your career would see positive growth. A diplomatic attitude & patience coupled with passion & skill will really make you powerful this year. There will be plenty of open windows of opportunity and you should harness them well. All your efforts would not go unnoticed and you can expect a great appreciation this year. You may also foray into a new business idea!